Over the past two years, Fuller Center for Housing supporters like you have helped us move families out of two filthy, unsafe shack slums and into two new communities of simple, decent homes. Families are seizing the hand-up you extend through The Fuller Center, and the model is such a success that we are doubling our efforts in 2018. But we can’t do it without you! This time last year, 6-year- old Sofia and her two older brothers got ready for school each morning in a rickety shack with plastic walls and a dirt floor in Ahuachapán, El Salvador, a poor community in coffee country. All of their neighbors lived in similar conditions. Today, Sofia is a happy 7-year- old who eagerly gets ready for school each morning in a safe, new Fuller Center home — with a concrete floor, plumbing, safe electricity, a sturdy roof and plenty of room for her brothers and parents. Not only did supporters like you make that happen for Sofia’s family, but also for 90 other families in the neighborhood. That’s right — 91 new homes were started and completed in 2017 in Ahuachapán. It was a remarkable achievement for a single year. Of course, our supporters also made a similar 90-home community rise in Nuevo Cuscatlán, El Salvador, in 2016. These communities utterly transform lives — by the dozen. These are miracles, but our generous supporters are making them almost common-place. Here’s the best news — with your help, we can do it yet again … and then some! With a significant pledge of support from an anonymous donor, we have begun building 55 more homes in Ahuachapán. Next, we will begin building 100 additional homes in Nuevo Cuscatlán this summer, and we will start another 100 homes in Ahuachapán in the fall if we can secure the land. All great stories deserve a sequel, right? Because a generous donor has stepped forward to fund much of this work, our cost to build these homes will be only about $1,000 each. This means that your gift goes much further — six times further — toward the construction of a home for a family now living in a shack. 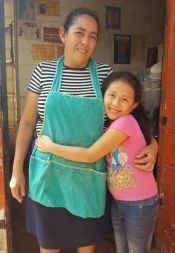 That means so many children of Ahuachapán like 9-year- old Marina will know the joy and security of having a simple, decent place to live — just like Sofia and her family. Dozens of her neighbors are eager to take hold of your hand and pull themselves up into a better life. Your support — and the hard work going on in places like Ahuachapán — made 2017 a record building year for The Fuller Center. We are growing and adding new partners across the United States, as well as in new international locations like Madagascar and Papua New Guinea. Disaster recovery efforts in Texas have been bolstered by steady teams of determined volunteers. Soon, we expect to be sending teams to Puerto Rico to help our fellow Americans on their long road to full recovery. 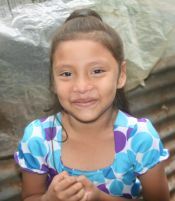 Will you help children like Marina have the strong foundation that comes with having a simple, decent place to live? Will you seize this opportunity to give a donation that has six times the power of an ordinary gift? You are part of a movement — a God movement. Together, we are demonstrating our love for God’s people in need around the world by putting faith into action. We preach the Gospel by doing. We are grateful for people like you who make it all possible.